96mm of rain not too wet so the cows are still out day and night and we have been able to build the bonfire without making too much mess on the orchard. The shed now has three bays with floors !!!! 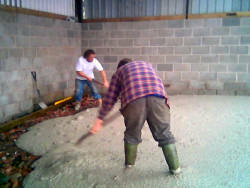 and here are the pictures of us laying the concrete. Thanks again must go to Mick for all his help and guidance. 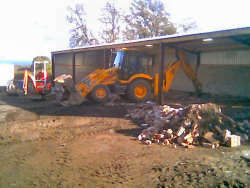 Before the concrete is laid preparation is essential and the base had to be levelled and compacted. 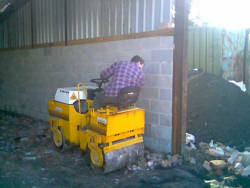 Levelling is shown here by a JCB from local plant hire firm Winsford plant but this vibrating roller compactor was from our old friends Moreton contractors who also helped out by providing some extra rubble for the base. To get the concrete level wood is placed at either side of the area to be concreted this is called “shuttering” and it is set to level using a spirit level and checked with the piece of wood to be used in levelling the concrete that both pieces match one another. This piece of wood is called a “tamp”. Action stations and here is the first full 6 cubic metre load being delivered ( “poured” as it is called). 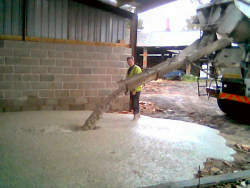 It took Mick, Simon and myself about an hour to level it to a smooth finish, this time of year is good weather for laying concrete as it is cooler for working as it is heavy stuff and also the concrete begins to harden quicker in higher temperatures and you would have an hour maximum to lay it. 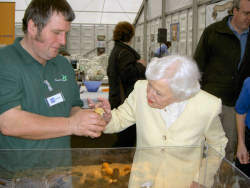 The end of October saw us at the Northwest Fine Foods festival at Tatton Park here is the stand and here is one of our celebrity visitors Margurite Patten pictured here is one of the original people to broadcast cookery on the TV. Don't forget to visit or nature page. Next month will see cows in for the winter the bonfire and our annual visit from Manchester University.